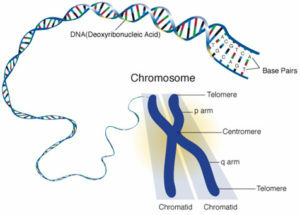 Long DNA strands are condensed and organized into 23 pairs of chromosomes. 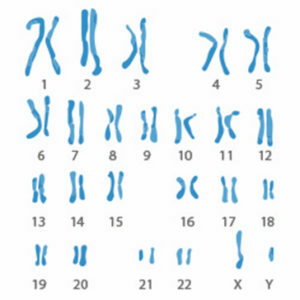 For each of your chromosome pairs, one is inherited from your mother and one from your father. Thus, you have 50% mom’s DNA and 50% dad’s DNA. Even though all humans are not directly related, 99.9% of our DNA sequences are identical. So why are we all so different? Mutations: Not always a bad thing! 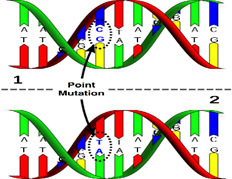 Differences in genetic sequences sometimes occur when there is a mutation. This means a certain base, or letter, is changed to another. Some mutations can be a deletion of a large part of DNA, or an addition of random bases. It can occur by mistake, during DNA replication or other biological events, or due to environmental effects, such as UV radiation. Mutations are often caught and fixed by intrinsic DNA repair mechanisms. A mutation can become a problem because it may result in changes to the structure of a protein, which alters protein interactions in your body. Other mutations can stop production of a protein. SNPs: Ancient (mostly harmless) mutations. Mutations that are a change in a single base are called single nucleotide polymorphisms, or SNPs. Most SNPs occurred in a small portion of certain populations thousands of years ago, which allows scientists to use them as a tracker for your ancestry. Oftentimes, SNPs are do not cause harmful changes in your genome, and act as useful markers that can help improve your health. When an SNP occurs in or near a region of DNA that codes for a protein, structural, functional, or interactive modifications may occur. As a result, certain biological pathways may begin to change, such as metabolism of medication in the liver. Since each person’s DNA sequence is different, especially when it comes to SNPs, it is possible to create a personalized treatment. Certain medications may be better metabolized than others, depending on an individual’s protein structures.